Enjoy an evening of music or sports at the Houston Toyota Center with the efficient service of C&S Executive Transportation. Hailed as the best car service provider in Houston, C&S Executive Transportation offers a 24/7 chauffeur-driven luxury vehicle service for a variety of purposes. Whether you are here in Houston for business or recreation, our company can surely provide you the best and most appropriate executive transportation service. You can hire one of our professionally driven executive cars, minivans, or coaches and be safely and promptly transported to your desired destination. 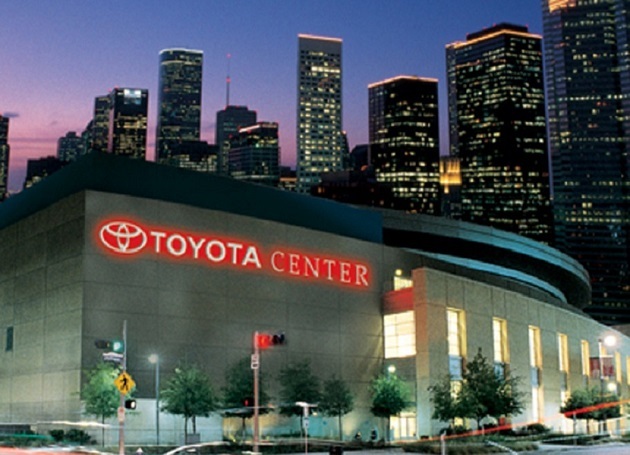 One of the mostly visited entertainment centers in Houston is the Toyota Center. This indoor facility used to be the home court of the Houston Aeros but is the now proud home of the famous Houston Rockets. This arena just underwent a major face lift in the early 2000s and Toyota Corporation decided to pay $100M for naming rights; thus naming this arena as Toyota Center. The arena can now accommodate more than 18,000 spectators so you are sure to have a seat when you purchase tickets early. The Toyota Center is not exclusive to NBA games. It can also be used for grand events such as concerts, private parties, and even meetings. The regular NBA season always starts in October and ends sometime in May. Between those months, the arena is reserved for the home games of the Houston Rockets. If you happen to visit the area during the regular season of NBA, you can easily purchase tickets online or at Toyota Center itself. You can their website for more details. This year, there are several major concerts lined up until November 2015. Some of the famous artists that will grace Toyota Center are Imagine Dragons, Nicki Minaj, Sam Smith, Motley Crue, Ariana Grande, Ricky Martin, and Billy Joel. Tickets for all of these concerts can be purchased online. When you book tickets for a group of 10 or more, you may even get decent discounts. Check out Toyota Center’s website for more details. It is best to purchase tickets now so you can plan your trip down to Houston and book your airport and city transfers with C&S Executive Transportation. Aside from basketball, UFC or the Ultimate Fighting Championship also graces the arena for some real mixed martial arts showdown. This year, UFC is scheduled to be at the arena on October 3 where MMA legends will take center stage and show everyone who the greatest fighter is. More details about the fight can be viewed at Toyota Center’s and UFC’s official websites. If you like less blood but more drama, the WWE is the right show for you. This year WWE will bring to Toyota Center its much awaited Night of Champions where legends like John Cena, Randy Orton, and The Authority may take the stage and battle for the championship belt. You wouldn’t want to miss this great show coming to Houston in September. Tickets will be sold as early as July 13 and it can cost as high as $400 and as low as $25. If you book tickets with 10 of your friends, you can surely get group discounts. Check out Toyota Center’s website for further details. Stand-up comic Kevin Hart will soon grace the arena on August 15 to 16 for his two-night “What Now?” comedy tour. Be sure to laugh your wits out at comedian turned actor Kevin Hart’s antics and comic spiels. Tickets are now being sold online for as high as $125 to as low as $65. You can have your own private function inside the halls of the Toyota Center. This indoor facility has a lot of private function rooms that can be rented out for private parties or business meetings. You can have a small party of 20 people to up to a grand event with 1,500 guests. There are a lot of events spaces within this arena that can accommodate your every need. Catering will also not be a problem because Toyota Center has an exclusive catering services, Levy Restaurants. You can easily have a blast with your friends and loved ones at the Toyota Center in Houston. It will be even more memorable and fun when you book all your transportation needs with C&S Executive Transportation. Our company will be more than glad to assist you with your executive transportation needs. With C&S Executive Transportation, you are sure to get to your destination safe and sound.